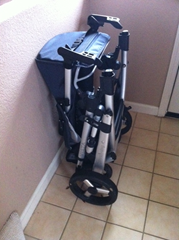 UPPAbaby Vista stroller with the RumbleSeat on and the car seat facing me. Enough room for our toddler, but not a ton of space. 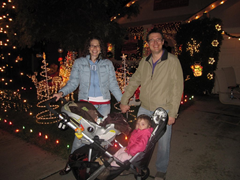 We purchased the UPPAbaby Vista stroller before we had our daughter, almost two years ago. Since then it has logged many, many faithful hours of service and we have been thrilled with its performance. For more information on how this stroller performs with just one child, including our thoughts on accessories such as the car seat adapter, you can read our review of the UPPAbaby Vista stroller. One of the reasons we chose the Vista stroller is its ability to become a double stroller with the addition of the RumbleSeat . So, when baby #2 came along recently, we were excited to see how our trusty UppaBaby Vista stroller did with two kids on board. One of the things we love about the Vista is its easy maneuverability. Even though it’s a full-sized stroller, it handles so well, even with one hand, that you can easily go through doors and bring it into the handicapped stall in a bathroom, too. This is really important for running errands. We’re happy to report that on a recent trip to our local Starbucks (we have one within walking distance), Wendy had no trouble navigating the door with no help. Even with the two kids in there, the stroller handled easily enough that it was no problem to hold the door open with one hand and steer the UppaBaby Vista stroller with the other. (Our daughter currently weighs about 27 1/2 pounds). Those big wheels on the UppaBaby Vista stroller make it easy to go up and over bumps and even curbs with just one child. This is often super helpful. But how would the stroller handle these obstacles when loaded with two children, especially since the heavier one is out in front? Well, you certainly will notice that the Vista doesn’t ride as smoothly with the RumbleSeat in use. However, it was still surprisingly easy to get up and over a curb. You’ll want to be a little careful going down over the curb, though. The stroller was unexpectedly tippy when the front wheels were down on the road and the back wheels were still up on the curb. That said, we are both very impressed that even with two kids in it, the UppaBaby Vista definitely can handle curbs and uneven pavement or gravel without a problem. 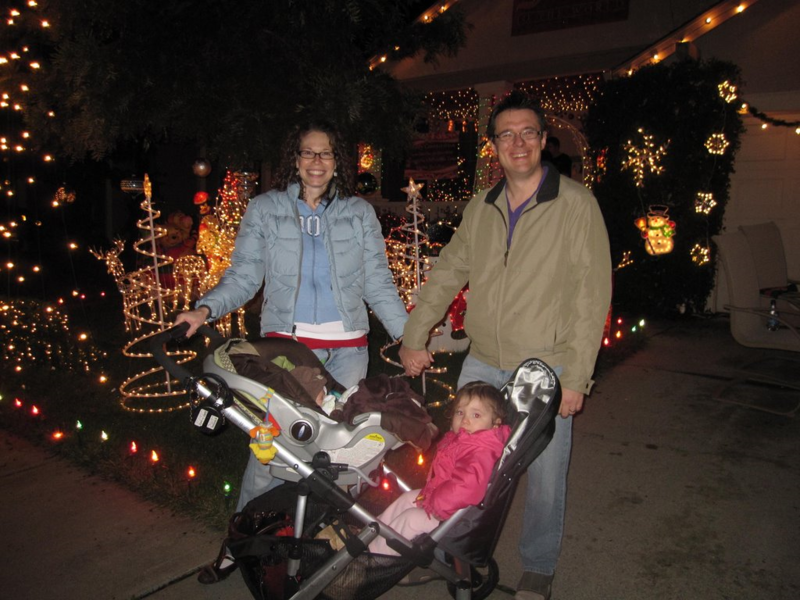 Out enjoying Christmas lights, this time with the UPPAbaby Vista stroller RumbleSeat on and the car seat flipped around so it's facing it. Much more room for our toddler - plus, you can see her while pushing the stroller. The RumbleSeat really makes the Vista into a great double stroller! The child sitting in the UppaBaby Vista RumbleSeat has their feet dangling in that gigantic basket that is one of the major reasons we love this stroller so much. While it definitely takes away some of the room, the intelligently designed (and included) kick-plate keeps the rear half (the part closer to you) of the basket clean and free of (muddy) shoes. That half of the basket is still comparable to the whole basket on many other strollers and is definitely still large enough to hold a regular sized diaper bag or some groceries. Having had the stroller to herself for the first 20 months of her life, we weren’t sure how our toddler was going to take to being “shunted” to the RumbleSeat. However, she is super happy sitting in it and can’t wait to go out for walks. The UppaBaby Vista instructions tell you not to allow your toddler to climb in unless the other child is already secured, but with or without our other little one in there, the Vista is stable and our toddler can climb in and out if she wants. There isn’t very much room in front of her face with the car seat facing mom or dad, but you can flip the car seat around so that it faces your toddler. You can still see baby and this way you can see your toddler, too. We’ve found ours loves to hold on to the car seat adapter as if it were handle bars! We’ve been very impressed with how happy the RumbleSeat has kept her. She seems very comfortable in it. Since it can’t recline, and has little space on the side to rest your head, we’re planning on using a Kiddopotamus & Co. Cradler Adjustable Head Support – Pink to help her nap while in the stroller. However, we’re not too worried about this. We also have (and love!) the UPPAbaby G-Lite – a fabulous umbrella stroller – and she naps in it with no trouble, despite its lack of recline. 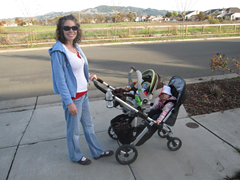 (Our review of the UPPAbaby G-Lite umbrella stroller). The UPPAbaby Vista stroller folds with the Graco car seat attachment on. The stroller stands on its own and the RumbleSeat stores neatly between it and the wall when flipped upside down. All in all it takes up remakably little room in our foyer for a double stroller. Those are 6" tiles, just for reference. The UPPAbaby Vista cannot fold with the RumbleSeat attached. Taking it on and off is SUPER easy, though. It takes less than 10 seconds, so this is really not a problem in our view. The stroller folds and stands by itself with the car seat adaptor attached, and we’ve found that if you flip the RumbleSeat upside down it fits nicely between the stroller and the wall. Given how large the stroller is, it’s really impressive just how compactly it fits in our (tiny) foyer. Overall, we’re really happy with how the UPPABaby Vista stroller has performed for us in the past and we’re excited that with the RumbleSeat we’ll be continuing to get lots more use out of this terrific stroller! Yes, it is an expensive stroller. However, with the UPPABaby Vista you truly are getting what you paid for. Given how much use a stroller will get, especially a good one that you actually want to/can use, we truly feel this was a great investment. Out at the park - notice how there's still room in the UPPAbaby Vista stroller basket for my purse, snacks and a couple of blankets even with the RumbleSeat on. Just so you know…no one has paid us to review the UppaBaby Vista stroller or the UppaBaby Vista RumbleSeat. We don’t have any connection to the company other than enjoying their products and haven’t been provided with anything for free or any other kind of compensation. These are just our thought on a fabulous product we paid for ourselves. Did you find this review useful? Do you own an UppaBaby Vista? 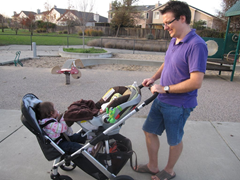 Own another great stroller you love? Tell us about it! We love hearing from our readers! Any purchase made after following an Amazon link helps support ianandwendy.com – thank you! More of a question than a comment- how did you place your car seat to face backward? Does the whole adapter click in either forward or rear facing, or is it not really “clicked in” when the car seat is rear-facing? Thanks! Hello! Yup – the adapter clicks in both facing forward and facing backward. It’s convenient if baby would like to look around more, too. Also, depending on where the sun is, it can really come in handy! I was wondering if it is only a Graco car seat adapter that will face both forward and backward? I have a peg perego seat and adapter and am wondering if it will do the same? Also, there is no option for the Rumble seat to face outward is there? My daughter enjoys facing outward more so she can see everything so i am concerned that she may be disappointed not to be able to look out while strolling. We weren’t too sure how she’d like the Rumble Seat at first, so we tried it out several times before Baby arrived. I didn’t want him to “take the fall” for bumping her out of her usual seat! For me, the benefits of the stroller outweigh its shortcomings. Good luck with your choice, and I hope that helps! Can you tell me if it still works well with a newborn in the main seat (not a car seat) and a toddler in the rumble seat! ?